Do you need judgement-free hoarding cleanup as soon as possible? Do you want to get your life back, help someone you love, or clean out a property you’ve recently obtained? HS Restoration has the perfect cleanup crew for you. Our hoarding cleanup experts can completely transform a house or room so that you can breathe easy again. Hoarding cleanup is complicated. Let us help you make it simple. Our culture has a strange obsession with hoarding. People create entire TV shows around the concept. However, hoarding goes far beyond what most people see on TV. 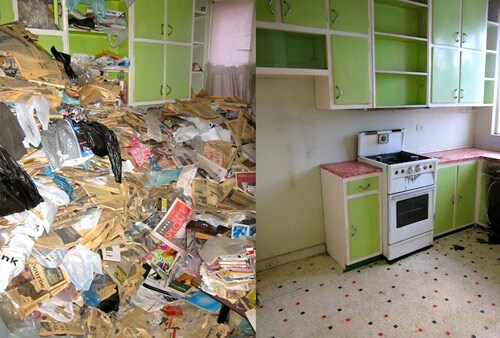 For those who have actually seen it or experienced it, hoarding is an overwhelming issue. Hoarding goes far beyond simple clutter. People who hoard items often fill their homes from top to bottom. Spaces become so packed that the people inside can hardly move. Often, hoarding also goes far beyond the “stuff.” Other hazards, such as animal infestations, can lurk beyond the surface. Until you start the cleanup process, you’ll never know just how deep the problem goes. You can’t have a successful cleanup if you don’t acknowledge the reason for hoarding. People don’t stockpile just for the sake of stockpiling. The truth is that hoarding is a mental health disorder. People hoard because it gives them temporary relief from deep anxiety. If you or someone you love hoards items, it’s important to acknowledge this anxiety before you move forward. That said, it is very important that you do get the space cleaned as soon as possible. Hoarding damage can happen in all sorts of ways, causing health problems and other dangers. First, there’s the surface level mess: the collections and stockpiles that most people think of when they think about hoarding. These items are fire hazards and tripping hazards. Many of them can also absorb bacteria and other health hazards. Next, biohazards come with some major risks. Blood and waste from both humans and animals can end up in hoarding spaces. These things get hidden underneath all of the clutter. Often, the person who hoards doesn’t realize that these biohazards are there. In any case, these substances can lead to serious illnesses. If water leaks or something spills in a place where somebody hoards, the person inside the home may never realize it. The clutter gets in the way, blocking these things from view. Water can damage wood, carpets, and other surfaces. It also leads to mold, another big health hazard. Your hoarding cleanup crew should be prepared to find and remove mold when they start the cleanup process. Hoarding can lead to other types of damage, too. All of them can be dangerous. Your hoarding cleanup crew may find broken glass, loose nails, needles, and all sorts of odds and ends. The house may have broken windows, smoke damage, or other issues that you might miss upon first glance. When it comes to hoarding cleanup, don’t delay. You need to clear the space as soon as possible. All of those issues that we mentioned above add up, creating a perfect storm of health hazards. Still, the urgency goes even further than those issues. Here are some of the other reasons why you should get hoarding cleanup sooner rather than later. With general clutter, you can clean a little at a time and make some great progress overall. Hoarding doesn’t work that way. With hoarding, the longer you let the problem go, the worse it gets. Delaying cleanup only leads to more health hazards, more potential injuries, and more clutter. You need a full, overall cleanup to fix the problem. We mentioned above that hoarding stems from anxiety. Hoarding help should include at least some mental health treatment. However, hoarding help also includes a major cleanup. After a certain point, hoarding cleanup becomes overwhelming. 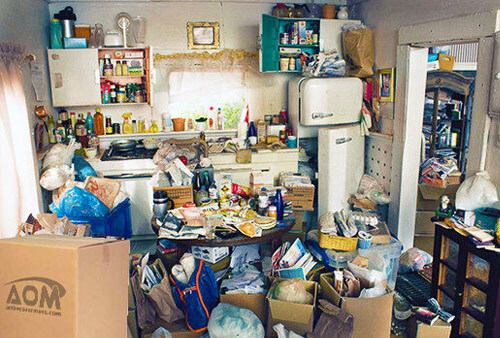 Hoarders and their loved ones often don’t know where to start. By hiring someone who can thoroughly clean the space, those who hoard can get a fresh start and a better place for mental clarity. When you need hoarding cleanup fast, how do you find the right cleanup crew? HS Restoration embodies all of the traits listed below. If your cleanup crew can’t provide all of these things, then it’s time to make the switch. We cannot stress enough how dangerous hoarding cleanup can be. Your crew absolutely must have the right cleaning tools and safety equipment. These items include face masks, special boots, and potent cleaning solutions. Without the right equipment, your crew can’t protect themselves or anyone else who enters the home. At HS Restoration, we’re equipped and ready to work. Next, look for a cleanup service that will communicate with you every step of the way. HS Restoration will help you decide which items to save and which ones will throw out. We’ll also keep you updated about our progress, providing estimates about how much time we’ll take on the project. If you have questions at any point in the process, we’ll be happy to answer them. Now, look for a service that keeps its clients happy. One way that you can do that is to check out some of the reviews. When a service consistently has happy customers, you’ll know that you’re making the right choice. At HS Restoration, we’re proud of our many success stories. You need hoarding cleanup, but you don’t need someone who will shame you or your loved ones. Don’t settle for any cleanup crew that will make you feel bad. Instead, let us bring our understanding and compassion into the project. Ready for us to start your hoarding cleanup? We’re ready to help. We can handle general cleanup, biohazard disposal, mold remediation, and everything in between. Let us help you get your life back to normal. Contact us today to get started.